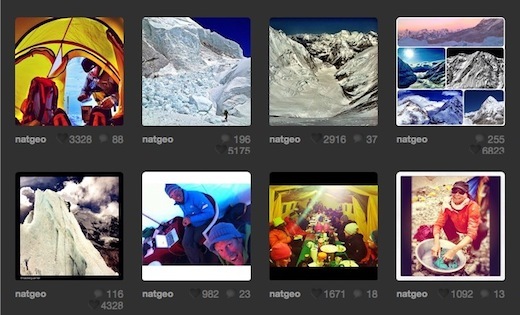 National Geographic was Instagram’s very first big brand partner and so it seems quite fitting that the media giant is using the photo sharing app for the very first time to let viewers in on an Everest expedition. With a National Geographic expedition team expected to reach the summit tomorrow morning, it’s the magazine’s Twitter and Instagram followers who will be the first to know the exact moment it happens, 3G network allowing. Following the team from the moment they set out, National Geographic has given its audience the chance to take a front row seat, watching the expedition as it unfolded, with a sense of immediacy that only social media can provide in real time. The magazine is going all out with its tech integration, keeping its iPad audience up to date with exclusive content, following mountaineer Conrad Anker and his team as they make their way to the top of Mount Everest. A dedicated section on its website also features a fair share of content, including dispatches, audio and video posts, and even a Google+ hangout, which took place at Everest Base Camp. Bringing Instagram into the expedition mix for the very first time, National Geographic’s follower count shot up by 40,000 new followers in the past 8 weeks of the journey, to a total of well over 60,000 followers today. While the National Geographic Instagram account has been around for a while, this expedition is the first time it has truly come to life. The images shared are a gorgeous combination of the scenery around them, the people they have encountered, and photos of the members of the team themselves. The social media journey to the top of Mount Everest will be culminating tomorrow morning (May 25) when the team sets off at around 5am Kathmandu time (GMT+5), and they will be posting photos of the summit, as soon 3G service is available. This expedition in particular also holds particular significance, as it commemorates the 50th anniversary of the very first American ascent of Mount Everest.